CARMAH – Why has China’s National Museum of Ethnology still not been completed, decades since its founding? Or, why such a museum should be! ‘China National Museum of Ethnology’ is clearly marked on the street map for Beijing’s Haidian district in the North-West of the city. This is an area rich in universities, including Peking University, Tsinghua and Renmin. It is adjacent to the campus of the latter that the National Museum is located. When I ask for directions at the gate of the University, however, I am told that there is no museum – ‘mei you’. This is correct. There is no museum that members of the public can visit. 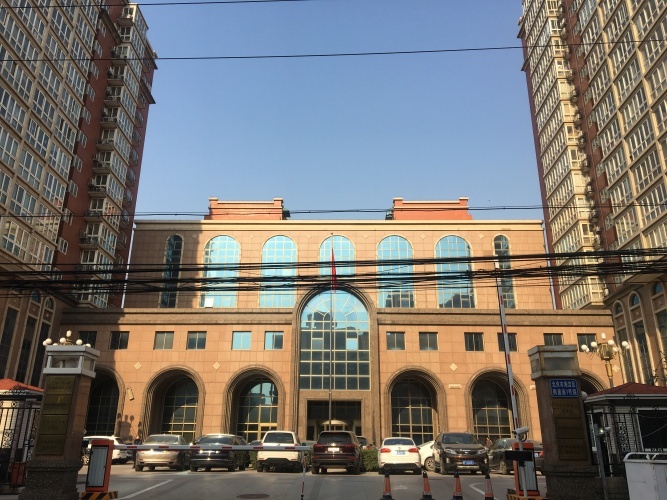 Inside a nearby building, the National Commission of Ethnic Affairs, however, there are large signs that read ‘The Chinese National Museum of Ethnology’ and two floors of offices. These house the more than forty staff who work for the museum. A significant number of employees have been working on the Museum project since 1984. But its origins are even earlier, making the question of its non-realisation still more intriguing – and also telling of the status of those who the museum is about, namely the shaoshu minzu, usually translated as ethnic minorities. ‘Ethnic minority’ is an official designation in China, there being fifty-five of such minorities, making up 8.49% of the total population according to the most recent census (2010). Discussions of ethnic or cultural diversity in China – especially official discussions – generally refer to these rather than, say, to diversity from more recent migration or to self-proclaimed diversity of groups that are not officially recognised. The National Museum of Ethnology is not, therefore, analogous to many museums of ethnology or ethnography in Western Europe, such as the Ethnological Museum in Berlin, where the focus is on peoples from outside the nation, and usually geographically distant. What it does share with such museums, however, is a history of regarding the peoples who it seeks to represent as ‘other’ – in the Chinese case, from the Han Chinese. It also shares a struggle to find new ways of representing that do not represent the non-Han as either less developed or as exotic, as museum staff explained to me. The difficulty, as ethnology museum staff in Europe also sometimes bemoan, is that the public may expect and even want exoticism, and might be disappointed not to find it. Solving this dilemma, however, is not what has delayed the opening of the museum – at least not directly. Rather, the delay lies in a combination of factors, including the disciplinary status of ethnology and the ambivalence of the ruling Chinese Communist Party government towards the ethnic minorities. This ambivalence has not remained constant over time but has, nevertheless, been sufficient to contribute to the proposed National Museum of Ethnology’s longstanding liminal state of (not quite) existence. A proposal for a Museum of Anthropology, to represent ethnic minorities, was made as early as 1921, by Cai Yuanpei, the first minister of National Education in the Republic of China and President of Peking University. During the 1930s he assembled a team of anthropologists to conduct ethnographic research for such a museum. 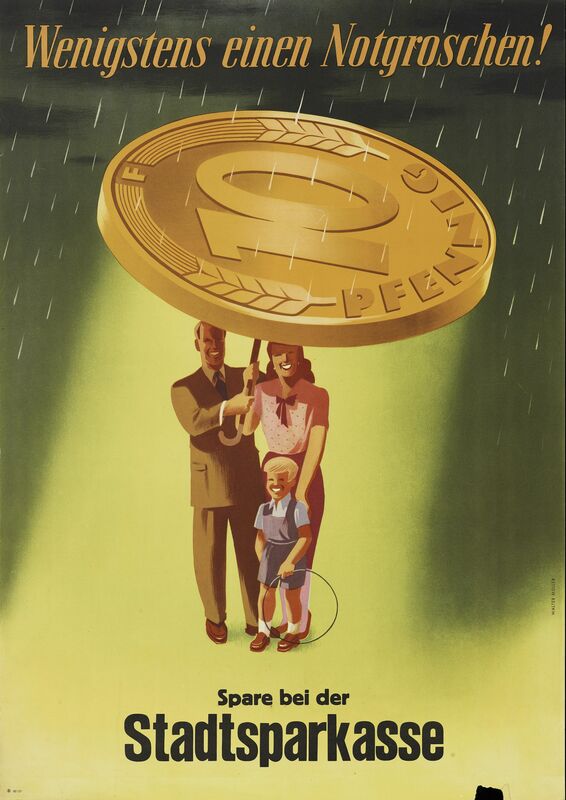 It was during the 1950s, however, that more concerted efforts were made. 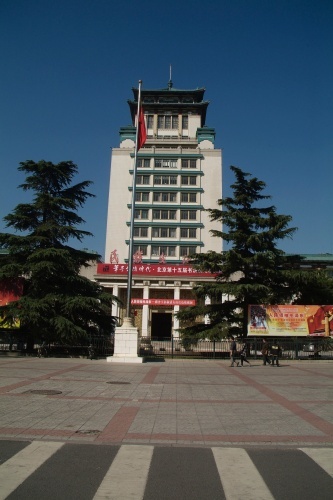 As part of a process of official identification and classification of minorities, documents and artefacts were collected (see, for example, Fan 2016); and then, as part of the decennial celebrations of the Chinese Republic, the Cultural Palace of Nationalities was opened in Beijing. An integrated complex of hotel, library theatre and museum, it was a location for social gatherings related to ethnic events. Later, it was also used for commercial purposes, not necessarily or primarily related to ethnic goods. Although the museum did display some items from minorities, and sometimes held temporary exhibitions about them, it was just as often used for exhibitions about that did not mention them at all. 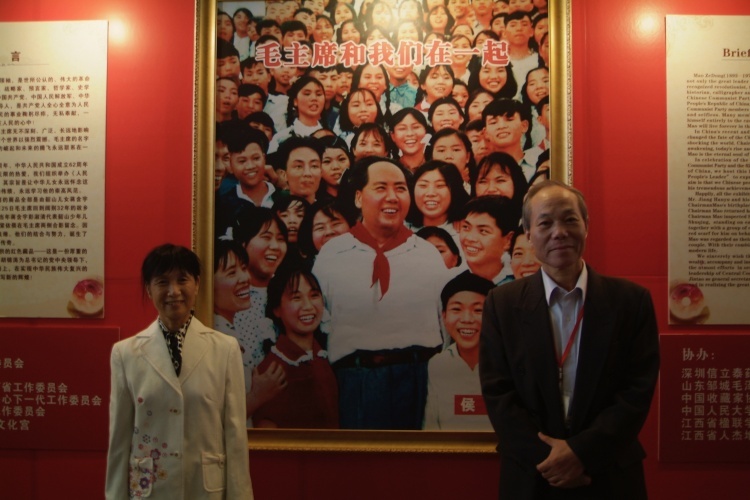 My own first experience of the Cultural Palace, indeed, was in 2011 to stumble into the opening of an exhibition of Mao-era propaganda, presided over by an elderly couple who had featured in the first posters of the Maoist Youth League. This exhibition and others like it were evidence of a less than wholehearted dedication to minorities. But its existence was enough to weaken the case for a national museum. Cultural Palace of Nationalities. Photograph by Sharon Macdonald, 2011. Exhibition of Mao-era memorabilia, Cultural Palace of Nationalities. Photograph by Sharon Macdonald, 2011. In the 1980s, after the Cultural Revolution, attempts to create more substantial collections that could lead to a national museum began again, led partly by the famous sociologist and anthropologist, Fei Xiaotong, who had played a major role in investigating minorities for their classification in the 1950s, before, like most social scientists, being made an outcast during the Revolution. He was a member of a committee of the State Ethnic Affairs Commission, established in 1984, to prepare for a national museum. As part of this role he went to Hainan Island to train twenty researchers – one of whom, still working in the Museum, I met – to collect for the proposed new museum. This resulted in over 2000 objects from the Li people, a collection that remains the best from this group and that is now held by the National Museum of Ethnology. But despite those promising initial collections, and despite the fact that since that time many museums of shaoshu minzu have been established at provincial level, especially in those regions with high numbers of minorities, the national museum towards which he was working still does not have a dedicated building with displays for the public. Making this non-existence still more surprising is the fact that the creation of such a museum has twice been listed in China’s Five-Year plans ¬ –first, in the 7th, directly after the establishment of the preparatory committee, namely 1986-1990; and then in the 12th, which ran from 2012 until last year. As far as the first of these Five-Year-Plans is concerned, there is, again, another museum that seems to have usurped the planned national museum. This is what on my free Beijing map is described as ‘Chinese Ethnic Culture Park’ but whose name above its entrance is given as ‘China Nationalities Museum’. 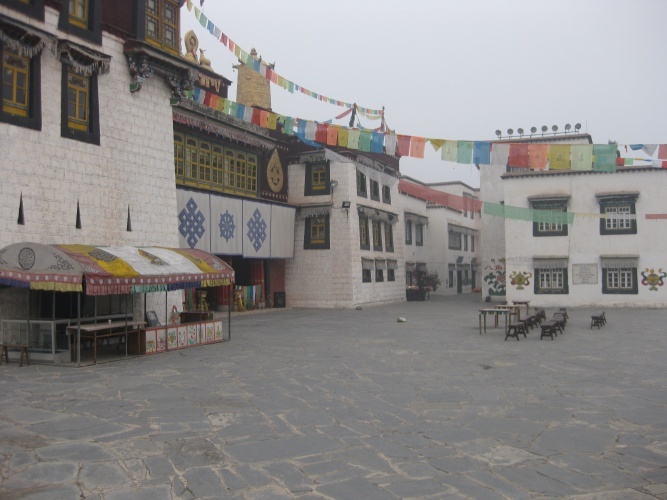 A large site in which minorities perform various dances, songs and other activities, such as painting, within buildings in the style of their home regions, the former title seems more accurate, though the site also includes buildings displaying objects in a museum style. Privately run and for-profit, part of the site was opened in 1992 and the rest in 2001. As Kirk A.Denton (2014: 209-10) describes, it was connected with China’s bids to host the Olympic Games, which it succeeded in doing in 2008, in a purpose-built area close by. Demonstrating a willingness to embrace cultural diversity was part of the necessary culture offensive to win the hosting. The performance of China as colourfully diverse was, indeed, a hallmark of the Games’ opening ceremony (though not without controversy). Like the Cultural Palace of Nationalities, the Ethnic Culture Park is different from the planned National Museum of Ethnology. While the Palace and the Park both have some objects, they do not have extensive or comprehensive collections and neither do they have the kind of scholarly documentation that should go with these. Researchers at the Chinese National Museum of Ethnology, however, have been undertaking field research and making videos of objects in use, as well as collecting and otherwise documenting both tangible and intangible cultural heritage over many years. On a recent fieldtrip, for example, ten villages were visited and over a hundred objects were collected, together with accompanying information. Altogether, the Museum now has over 30,000 objects. But although museum staff create temporary exhibitions for a variety of locations, they still have no museum building of their own. 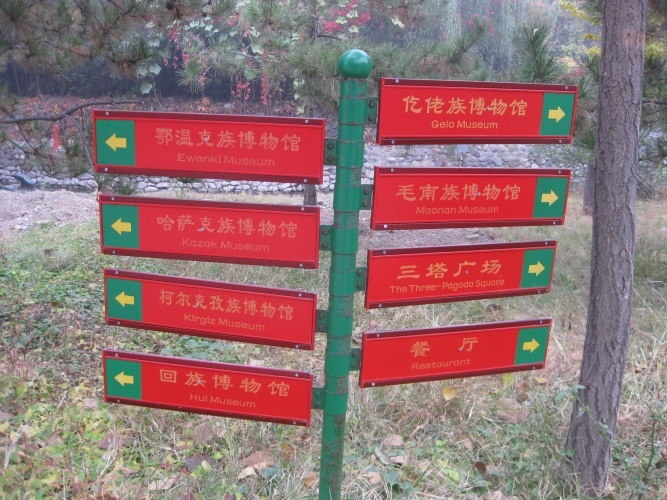 Images of the Chinese Ethnic Park/China Museum of Nationalities. Photographs by Sharon Macdonald, 2011. 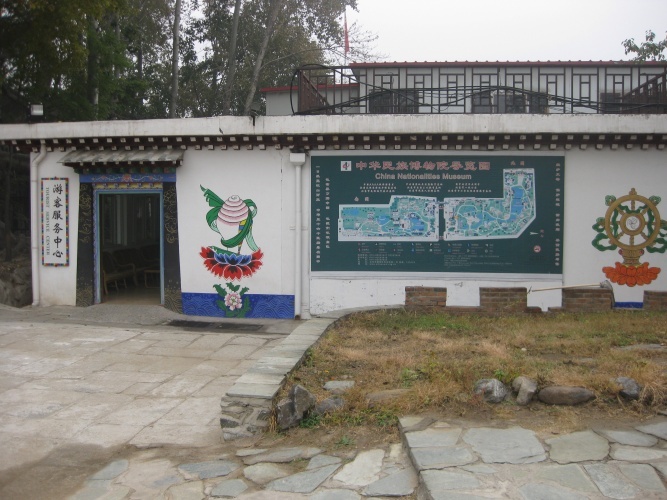 Existing museum treatment of ethnic minorities – in the Cultural Palace and the Ethnic Park, and also in provincial Minzu (i.e. ethnic minority) museums – follow a standard historical narrative. The emphasis is on presenting the fifty-five groups as fixed and enduring facts, exemplified by differences of dress, ritual, dance and song, art, and food and drink. Typically, representations feature many smiling, especially female, faces. Family metaphors are not uncommon (see also Fan 2016). In one Minzu museum I was told, with no discernible double-entendre, by a minority guide: ‘We are one big family – brothers and sisters – with big brother Han’. Information about the history of groups or about the history of the classification processes – in which groups came to be labelled in ways that did not always accord with their self-identifications – is virtually never given; and campaigns for recognition are not mentioned. Different religious beliefs are only lightly addressed by presenting them as matters of ritual practice. And perhaps needless to say, there is never mention of geo-political claims. Tibetans, for example, dance and sing happily in the Chinese Ethnic Park. 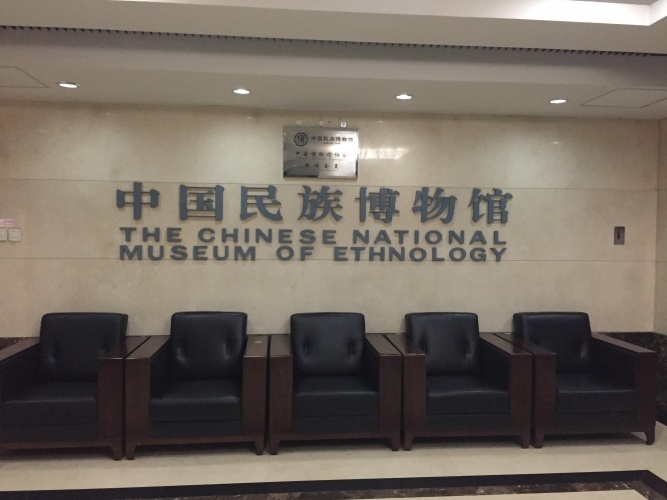 Including some of these issues within a National Museum of Ethnology might well be difficult and as such unlikely within the prevailing political climate, not least as museums, especially those at national level, must obtain approval from the ruling Chinese Communist Party. At present, the direction of travel on questions of cultural diversity seems to be the other way. Exemplifying this is that the government has stated that it will not allow any further ethnic minorities to be officially recognised, and that the acceptance of people listing non-recognised ethnic identifications on their identity cards – which has been permitted for the last twenty years – is no longer permitted. Nevertheless, as in other countries around the world, it is surely important to find ways to represent the cultural heritage of diverse groups in respectful ways that do not exoticize or over-simplify. This means going beyond formulaic models in which peoples are presented as essentially unchanging and ‘peoples without history’, as Eric Wolf has famously put it in his criticism of this position. It means showing not just that there are diverse cultures but also the diversity that may be present under a single name; and it means not only presenting according to an already-decided set of criteria but also taking into account the latest research and the views of the people themselves. ‘Multiperspectivity’ – showing the diversity of viewpoints, including within particular ‘cultures’ (such as those of women and men) – has become a watchword in much contemporary ethnological museum display. Likewise, showing the processes of research – how collections were made and by whom – and the changing ideas about the peoples and cultures represented have also become hallmarks of state-of-the art ethnological museum display around the world. Ethnological museums ¬ – as holders of collections about diverse peoples, whose artefacts and practices were usually not traditionally gathered up as highly valuable – are home to much culture, and cultural diversity, that might otherwise be forgotten or neglected. This is the case whether those collections are from within the nation-state boundaries or outside it. For many peoples – as well as China’s ethnic minorities – inclusion of their heritage in a museum is a significant marker of recognition. Recognition in the form of a national museum is an even more important statement of worth – and also of national belonging. Ethnological museums are – or can be – about more than just illustrating cultural diversity and giving recognition to particular groups, however. Rather, they have the potential too to prompt visitors to think about different ways of living and being in the world, and about the nature of relationships between different peoples. They are able to raise questions about social and environmental change, about cultural practices and sustainability, about what can bring hope and joy to existence, as well as to what can trouble it. They can open up other ways of seeing and doing – including, potentially, of seeing and doing difference and diversity themselves. In some ways, China’s National Museum of Ethnology is in an especially advantageous position to create a cutting-edge museum that meets and even surpasses international standards. It has a substantial and well-documented collection; it has a fascinating and long collecting history; and it is linked with other important research organisations, such as the Minzu University around the corner. In addition, it has the potential to be a museum that is not just made ‘about others’. Many of its staff members are themselves shaoshu minzu. 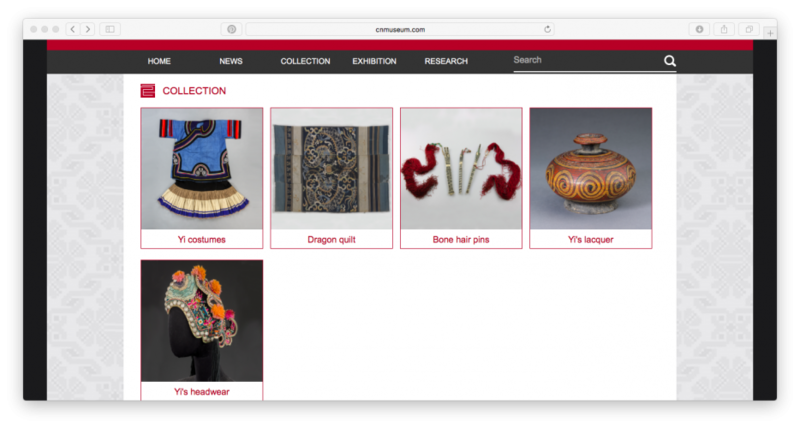 Screenshot from the website of the Chinese National Museum of Ethnology, September 2017. At present, the Museum continues with its work: collecting, documenting, classifying and conserving objects; creating temporary exhibitions, publications and an impressive website; helping to organise performances and conferences. In doing so, its staff are not only assembling more material for showing in the future, they are also conducting vital research on the changing and dynamic cultures and self-narratives of the shaoshu minzu. At the same time, they are attending to international debates and ideas through conferences and discussion, as part of their search for the best ways of creating a lively and engaging museum display capable of articulating cultural diversity respectfully and honestly. As for ethnological museums in other parts of the world, this also means finding ways to acknowledge and include potential complexity without baffling visitors, and allow for the possibility of multiple identifications, including with the nation as well as with the minority nationality. There is no doubt that such a Museum could be an important contribution to China’s range of national museums – further showing the diversity and history of the nation, as well as giving long-awaited recognition to its ethnic minorities. I thank those scholars and museum staff in Beijing who have assisted me with this article. Especial thanks are due to Pan Luo. My initial work on ethnic minority cultural heritage in China, on which this article partly draws, was funded by the Leverhulme Trust. My more recent research on ethnological museums is funded by the Alexander von Humboldt Foundation. Denton, Kirk A. 2014 Exhibiting the Past. Historical Memory and the Politics of Museums in Postsocialist China, Honolulu: University of Hawaii Press. Fan, Ke 2016 ‘Representation of ethnic minorities in socialist China’, Ethnic and Racial Studies, online version. Gladney, Drew C. 2004 Dislocating China. Muslims, Minorities and Other Subaltern Subjects, London: Hurst and Company. Kim, Keun Young 2011 ‘Museums and multiculturalism in China’, University of Michigan working paper in Museum Studies. Varutti, Marzia 2014 Museums in China. The Politics of Representation after Mao, Woodbridge: Boydell Press. Building in which the Chinese National Museum of Ethnology is located. Photograph by Pan Luo, 2017. Entrance Hall of the Chinese National Museum of Ethnology. Photograph by Sharon Macdonald, 2017. Sharon Macdonald is Alexander von Humboldt Professor of Social Anthropology in the Institute of European Ethnology, Humboldt-Universität zu Berlin. She founded and directs CARMAH. In addition to directing the Making Differences project, she directs the Contentious Collections workpackage of the Horizon 2020 project TRACES: Transmitting Contentious Cultural Heritages with the Arts: From Intervention to Creative Co-production; and the Profusion theme of Heritage Futures. Within Making Differences, she conducts fieldwork on the making of the Berlin exhibition in the Humboldt Forum.